Where to stay when going on vacation to Orlando can be a big question. For us, the answer is simple, we have a time share*. No, we're not members of the Disney Vacation Club (mainly because I'm an idiot), but we have the ability to stay a week in Orlando for <$200. Not too shabby, if you ask me. However, we are going to be staying "On Property" for the first time this trip, even if it's only for a couple of days, so I want to go into how we decided which hotel to pick. The first thing I did was consult the experts, and by that I mean Scott & Scott from "Earning My Ears". Both of them are huge Disney fans, Walt Disney World in particular, and they frequently stay on property. So I laid it all out for them and got a couple of recommendations. What they suggested, though, is to try for a Moderate Resort. Yes, they cost a little more, but they are more than worth it, according to the guys. They actually recommended the "Port Orleans - French Quarter" as one to check out, so I did. Not only did I read up on it on the WDW website, but I found several YouTube videos where people showed the rooms, lobby, pool, etc. Watching these pretty much clinched it, and that's where we're going to book. All that being said, one day I'd love to be able to stay at The Contemporary Resort. 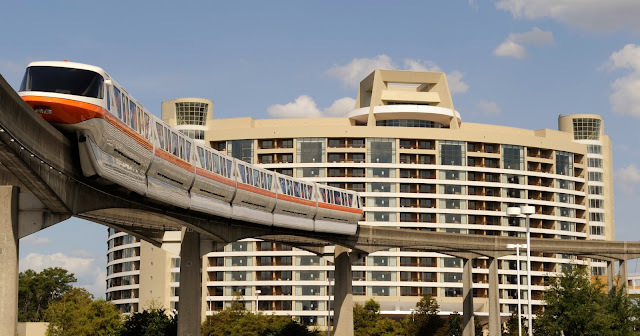 Not only is it one of the two resorts that opened when WDW did, 45 years ago, but the Monorail runs through the hotel! How cool is that!?!? * If anyone would like a good deal on purchasing a time share, let me know. I'd much rather sell this and buy into the DVC. Not that I'm unhappy with what we have, but with the amount of time we're probably be going to be spending at Disney over the years, DVC would just make more sense for us.